There’s a moment when I know I can trust you with my body. We are getting lunch together, navigating seating in fixed booths or narrow chairs. Or we are shopping for clothing together. Maybe we are seated next to one another on a plane. Whatever it is, the situation warrants an acknowledgement of the breadth of my body. That acknowledgment will often include two simple words: I’m fat. For me, saying I’m fat is a simple statement of fact. It is a reality of the body I live in every day, and an inescapable truth of how I am received in the world.The harm comes not with the words used to describe my body, but with how my body is treated — how it is shunned, scapegoated, hurt. I’m not afraid to say I’m fat. Because I am. Despite the realities of my experience as a fat person, people who don’t wear plus sizes regularly avoid naming my body. Many even go so far as to object to my characterizations of it, responding with an urgent, involuntary sweetie, no! you’re not fat! But saying I’m fat is an offering to them, and to you: you needn’t tiptoe around my size. I don’t. Saying I’m fat becomes a moment of truth, and a barometer of trust. Will you contract into a knee jerk objection, as so many thin people do? Will your eyes widen, skin flush red, your body tense with the muscular language of fear?Will you bend gracefully into a swan dive of cruelty, offering up harsh assessments of my body that you previously withheld? Or will you stay mercifully silent? Will you trust me to name my own skin?Will you stay with your own tension long enough to explore it? Will youbreathe deeply enough to ask me the questions you have — the ones that give birth to such discomfort? Will you listen carefully to the answers you’ve requested? Will you let this conversation ebb and flow, like the rest? Or will you retreat into your learned discomfort? This, my darling, is how I know whether I can trust you with my body. I have become so accustomed to the aggressive discomfort of the thin. Its self-appointed status as judge, jury and executioner. Its ruthless cross-examinations of diet and exercise, looking for fatal flaws that will lead to conviction. Its unease with short and simple descriptors, or the fact of a bodylike mine. Its inability to listen to what it hasn’t heard before. The deepest relief comes when you, someone who doesn’t wear plus sizes, arewilling simply to hear me, someone who does. When you are willing to believe me. When you trust my experiences as I report them, not resorting to easy disbelief or rote insistence on their impossibility. It means so much, just to be believed, trusted, engaged. When someone doesn’t object when they hear I’m fat,I can feel the muscles in my neck release their stranglehold. My tight lungs loosen, breath sinking into my chest like cool water. Over time — months or years — my shoulders will fall, their knots untied by your willingness to hear me as I speak, see me as I see myself. If you ask more questions, we will talk more about my body, and my experiences in it. We’ll talk about yours, too. We’ll hold our experiences up to the light, letting it shine through to find where our bodily lives overlap, and where they diverge. It is a simple, beautiful conversation, open and loving. If you are a white woman, as I am, that support will likely come with a statement of sweet and misplaced solidarity. It’s just terrible, you’ll say. It really is the last socially acceptable kind of discrimination. What you mean to say is heartfelt, reaching through a vast emptiness to find connection. You are doing a courageous and appreciated thing: embracing bodies that you have been told your whole life not even to describe. If you are thin, you are acknowledging the treatment I face in a body my size. You are actively deciding to stretch beyond the mistrust of fat people that you have so consistently been taught: the belief that there is always a fatal flaw that has led us to our failing bodies. The belief that you are the detective to locate that flaw, and solve its crime as only a thin person can. More than that, if you are thin, you are expressing outraged solidarity that anyone is being dismissed so callously, rejected so consistently, hurt so publicly in this day and age, just because of how they look. I appreciate the sentiment —it is a rare one. If you are fat, you are telling me that you are learning to embrace your body in a world that refuses it. That you are acutely aware of all the ways in which you are not desired, not respected, not embraced, somehow a spectacle and a specter all at once. Embracing a fat body is no small feat, especially in a world that believes our bodies can only be failures or blights, and increasingly insists we should not exist at all. But when you tell me that fat hate is “the last acceptable form of discrimination,” your words carry more weight than just your intentions. Often, you are telling me that amongst your family and friends, you believe that discrimination simply isn’t tolerated, except in this instance. But the hallmarks of prejudice aren’t always as pronounced as slurs, votes or assaults. Often, it moves more quietly, having learned not to show its face, instead making itself known in less tangible ways — jokes and offhand remarks. But if those smaller moments go uncontested amongst the people you love — at Thanksgiving or family reunions, in discussions about elections or immigration policy — then prejudice is acceptable, because it is accepted. We make it acceptable when we tell ourselves my uncle’s never going to change, so why try? We condone racism, transphobia and more when we tell ourselvesthere’s no point in arguing. We permit all kinds of oppression, you and I, when we justify and excuse others’ perpetuation of them. Sometimes, “the last acceptable form of discrimination” means your family and friends don’t experience discrimination, because you walk through life together with similar experiences. The experiences of the people you love do not push you to see the long shadow of bigotry in your daily lives or theirs.Despite your best intentions, you have not seen its rough silhouette. You have not been pushed to strip away your own corrosive residue of bigotry, left behind by living in a society that insists there is none. “The last acceptable form of discrimination” is a gift, a sign of the carefully insulated company we are blessed to keep. At other times, “the last acceptable form of discrimination” tells me that you think some discrimination is justified. If I ask about the conditions in immigrant detention centers or prisons, you may tell me they should’ve thought of that before they broke the law. You may tell me that it’s not discrimination because they chose their fate. But you could have done things differently if you wanted to is the very justification and misunderstanding used against me. It is the bedrock that allows the discrimination you decry. But at its core, “the last acceptable form of discrimination” tells me what you have and haven’t lived; what you do and don’t recall. It tells me that you do not remember the grief of Black Americans, mourning family and community that are routinely shot in the streets, unarmed and defenseless. You have not wondered if your child will return home when he leaves in the morning. It says that you cannot recall the heartbreak of trying to find a home or a job for a family member who has recently been released from prison. You have not found the glowering and frightened faces of strangers who assume their past makes them dangerous. You have not struggled to leverage your clean record to benefit someone you love, only to be thwarted by trap doors of their deep, fearful assumptions. It tells me that you do not know or recall life as an immigrant in the United States. Your memories of Sherriff Joe Arpaio’s tent cities are distant and faded. You have not wondered how long it will be until your house is raided, your family wrested from the home you built together. You have not applied for a job only to find that you were undocumented all this time, your body an uninvited guest without a home of its own. It shows me how quickly you have forgotten the white supremacists that marched through the streets of Charlottesville, Boston, San Francisco — so many cities, just this year. It tells me that you did not believe that they were laying in wait, actively recruiting all this time, preying on the racist attitudes you and I left uncontested. It tells me that you likely are not transgender, nor have you sat with a trans person when they try to get health coverage, a job, a place to live. You have not scraped together what little you have to pay bills on an income well below the poverty line, with no financial safety net from family that has rejected you.You have not listened to the reading of names at Trans Day of Remembrance, hearing of the deaths of person after person who was murdered just for looking like you. You do not remember what it feels like to know you might be next. “The last acceptable form of discrimination” implies that you have reached the end of your learning. It tells me that your life is uncontested enough to let you believe that one day, oppression just ends. You do not know or remember the ways in which it is forced beneath the surface, the way it mutates in the swampy waters of our subconscious. You have not seen its monstrous face lurking in the depths below. You have not felt the tug of its undertow on your ankle, threatening to pull you under. Beyond your good intentions, “the last acceptable form of discrimination” tells me that you believe racism, sexism, homophobia, transphobia, ableism are all completed chapters, and that they have closed for all of us. But our attitudes are not so simple, our intent not foundational, and our history not so straightforward. It tells me that your intentions are good, but that they are unexplored. You do not yet hold the research or the relationships that would require you to delve deeper, beneath the surface of your own goodheartedness. You do not know that I do not fear for my life as a fat person. Fat hate may drive some to mock me, hurt me, insult me, deny me services, health care or a job. But it likely will not drive someone to murder me. 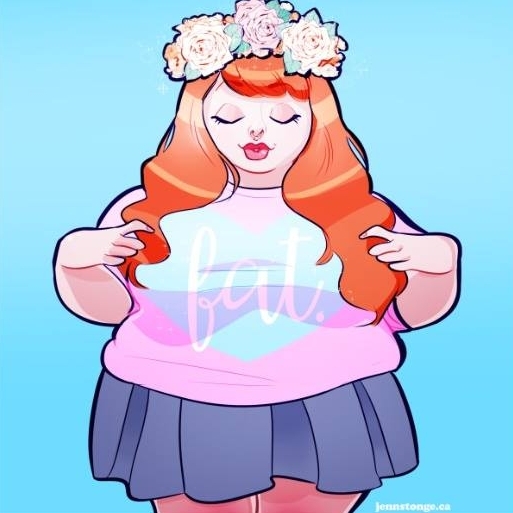 Each day, I wake up a fat woman in a world that wishes I didn’t exist. But I also wake up a white woman in the United States. I wake up in a home of my own, with friends — like you — who love and support me. Yes, I am hurt. But I also carry generations’ worth of gifts and benefits, bestowed by a culture that values my whiteness above all else. I value your growth, and I treasure your solidarity. But, more than anything else, I cannot let your support of me come at the cost of your support and remembrance of anyone else. You may know me. You have held my hurt close, cradled it against your breastbone, nursed it back to health. I love you for that. But your intimacy with my pain doesn’t erase the deeper needs, the bodily safety, and the unheard voices of so many more. The countless people who know that, despite your best intentions, there is no last oppression. Like a virus, oppression mutates, adapting to its environment. And as with any disease, meaning well is not a cure. It cannot simply be wished away.